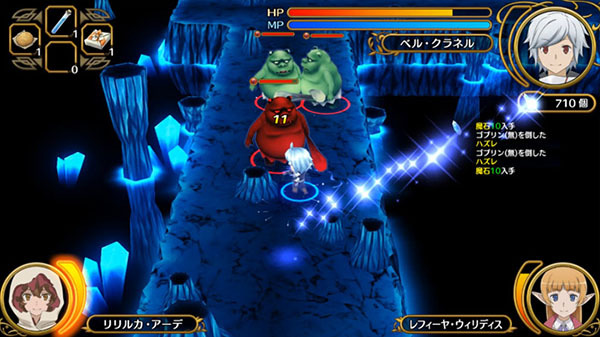 Dungeon exploration action RPG Is It Wrong to Try to Pick Up Girls in a Dungeon? Infinite Combate will launch for PlayStation 4 and PS Vita in spring 2019 in Japan, publisher 5pb. announced. The standard edition will cost 7,800 yen and the limited edition including the game’s original soundtrack CD and “Adventurer’s Guidebook” will cost 9,800 yen. 5pb. also announced that the game’s theme song is called “Treasure,” which is performed by Yuka Iguchi, written by Satomi, and composed by Ryosuke Shigenaga. Clear Quests Issued by the Guild to Advance the Story – The basic flow of the game is as follows: Guild –> Dungeon Exploration –> Battle –> Return from the Dungeon. The game is set in the city of Orario, which features various adventurer-focused facilities. The player will utilize these facilities while advancing the story, exploring the dungeon, and interacting with characters. Guild – Receive quests at the Guild, then head for the dungeon. Familia – The goddess of your Familia can unlock skills for the player character. Market / Blacksmith – Buy and sell weapons, armor, and items, or strengthen weapons and armor. Hostess of Fertility Pub – A place where various adventurers gather to exchange information and the like. Dungeon Exploration – Bell and Ais’ stories will play out for each chapter. For each story, you will control and explore with the respective character. Your dungeon user interface includes the following: your HP, MP bars, skill gauge, acquired magic shards, item slots assigned to each d-pad key, and pre-chosen support characters and their skill gauges. Each support character can activate various skills. Date and Hot Springs / Co-Sleeping Events – High-difficulty quests will also be added to the Extra Dungeon, which is unlocked after clearing Story Mode. By clearing these quests, you will be able to enjoy date and hot springs / co-sleeping events.